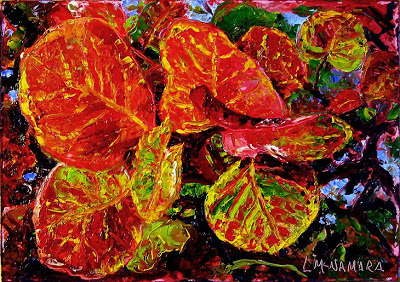 “Sea Grapes” by Lori McNamara, 2008, oil on masonite. While I waited at the traffic light on Canal Street, a toddler straddled his mother’s hip and kicked off his tiny red sandal. He looked down, wiggled his foot, but didn’t have words. I was driving home from the office with my music on loud. My family had just returned to New Orleans after living for four months in Houston. A continuous rusty waterline cut through buildings and houses. We lived a mile away and on a ridge. The woman stood at the bus stop dressed in turquoise scrubs, and her toddler waved his sippy cup at whoever might notice. There was only one hospital open five miles away, and she’d probably taken the Uptown bus to get to the Broad Street bus. The light turned green and I didn’t pull over to pick up the shoe and return it to the woman before she boarded. When she noticed her baby’s bare foot she would rush up and down the aisle, searching, and the little shoe would be back in the cross walk, waiting, useless because it needed a match. I kept going. Chances were good that her house had flooded. Our house had come through Katrina high and dry. I went back the next day for the tiny red sandal. Someone had pushed it to the curb and I kept it as proof of this part of myself. This entry was posted in Archives, ShortsOnSurvival and tagged spring2016 by Mary Akers. Bookmark the permalink. Pingback: What I Meant. | JUST LIVE HERE.